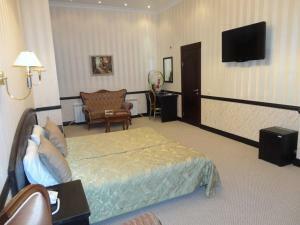 Stop at Astra Hotel to discover the wonders of Almaty. Featuring a complete list of amenities, guests will find their stay at the property a comfortable one. Service-minded staff will welcome and guide you at the Astra Hotel. Comfortable guestrooms ensure a good night's sleep with some rooms featuring facilities such as air conditioning, heating, wake-up service, desk, mini bar. To enhance guests' stay, the hotel offers recreational facilities such as fitness center, sauna, indoor pool. A welcoming atmosphere and excellent service are what you can expect during your stay at Astra Hotel.